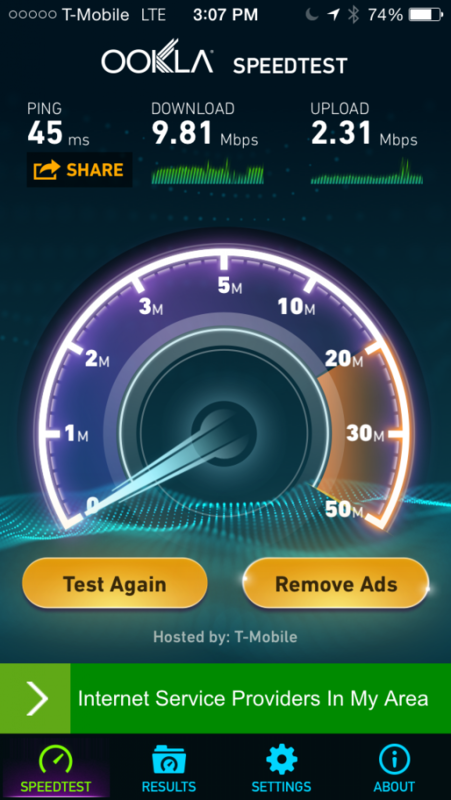 Doc Searls Weblog · What’s up with @TMobile in North Carolina? It might not just be T-Mobile Doc, I’m on Verizon and been traveling in the west for 10 months (15,000 miles) and I’ve almost always had LTE service whereas voice has been sketchy. I don’t have any reference areas like you to compare before/after though. I finally bought a cell booster for the voice part – mixed results on that though. T-Mobile service has become almost unusable here in Redwood Shores, CA (which lies between SF and Palo Alto). I have to go outside the house to get a signal. Sure it’s LTE but if I can’t even make a call, who cares what it is. I noticed the change in the last month. Pretty much the same here in Southeastern New Hampshire. It’s fine near the highway but spotty to non-existent in other places. Our new house is 3 doors down from a hidden cellphone tower which I’m guessing T Mobile isn’t on because I only have 3 dots at home. Doc, you know more about wireless radio waves than us but don’t data and voice transmit over separate frequencies so an LTE data indicator has nothing to do with voice? And, the number of bars has nothing to do with wether you can actually make a call, it shows the tower signal strength to the phone not the phone transmission strength back to the tower. That’s the way I understand it anyway. About what the indicators mean, I have long assumed that the five dots, or bars, refer to signal strength of the telephony service, while “LTE” “E” or nothing indicates the presence or absence of data service, but nothing about strength of the signal. The graphic above suggests that my assumption is true, but I don’t know. My phone (Nexus 5, stock Android) provides only a single set of bars to indicate connection strength, so my assumption is that the bars applies both to telephony and data. Under the “preferred network type” settings, the choices are among LTE, 3G and 2G — and no indication that one may set preferences for data separately from the phone; it’s presented simply as a single network setting. So, if T-Mo is changing anything in the balance betwen telephony and data, it would not be visible on my phone. T-Mobile is at its worst when I’m bicycling long distances on blue highways and backroads. People around me are Facetiming with friends, and my T-Mo phone has no bars, no data, nothing. But they make overseas travel much less of a hassle, with their international provision of free data/text, and tolerable telephony charges. No need to swap out SIM cards or to sign up for separate international service. They make it very easy. Domestically, T-Mo also lets you stream nearly every music service (Amazon notably excepted) from the cell tower, free of data charge. This, to me, is borderline amazing. And I must acknowledge that T-Mo’s customer service has been, for me at least, first-rate. All of which ameliorates my frustration with their spotty coverage. Good analysis, which is entirely consistent with my own experience, except that I haven’t checked out the music streaming yet. It would be nice if we knew what the dots or bars actually mean. Strange to get no telephony and fast data at the same time and place. The international service is the deal-maker for us. After struggling for years with Verizon and AT&T, T-Mobile has been a huge relief. We’ll be in Prague this month, and in the U.K., Brazil and Sweden before the end of the year, and I expect no problems at all. The 2G data rate can be a bit of a slog, but it’s fine for bringing up maps and doing email, which are the main things. (And sometimes it actually does 3G, or so it seems.) And where we go in urban and suburban areas in and around NYC, SF, LA and Boston, T-Mobile is actually better than AT&T (our last carrier) was for us. And you’re right about their service. It’s solid and good on the phone. Less so in the stores, which vary a great deal; but they’re all like that. Digression… I visited a Verizon store in Ohio, where my son goes to college and Vz is the only mobile game in town. He wanted to switch from Sprint. But, even though Sprint and Vz are compatible — both on CDMA — they didn’t even want to talk unless he was willing to ditch his current phone and buy one from Verizon. So we left. Perhaps, in the fullness of time, T-Mobile can beef up coverage on the blue highways at least. I’ve been having the opposite issue – my data signal has been cutting in & out since the beginning of September, but the voice signal is fine. I have a Nexus 4 so no LTE data, only H and 3G (and E when unlucky) are available. I’ve contacted T-Mobile’s help desk but they really weren’t much help. I forgot to mention – I’m in Seattle.